CarGurus has 72,768 nationwide Explorer listings starting at $750. The 2010 Ford Explorer continues to deliver all the favorite features owners have come to expect from this functional SUV, including seating for up to seven passengers and plenty of cargo space when the back seats are folded down, and supplements those benefits with a smooth ride, decent performance, good handling, and a wide range of trims, options, and available packages from which to choose. Interior ergonomics and the layout of the '10 Explorer's dashboard remain sore spots with many drivers, who have difficulty reaching some controls, such as the climate controls, which are often blocked by the shift lever. Reportedly in the final year of its current generation, the 2010 Ford Explorer will soon receive a much-needed makeover, drastically changing its current platform and profile. Still, the Explorer continues to deliver sought-after features, such as its functionality, performance, and sure-footedness, which have made it one of the most popular SUVs over the past couple of decades. While prospective owners in the market for an SUV may want to wait to see what the next year brings, good deals might be available this year, making the 2010 version of the Explorer too good to pass up, especially for those with families who require the space and versatility offered by Ford's venerable SUV. With a major redesign reportedly planned for the Explorer in 2011, Ford makes only minor updates to the 2010 Explorer, which will be the last of its generation. The current design dates back to 2006, and for 2010 changes focus primarily on the mid-level Eddie Bauer trims, which receive a third-row manual-folding 50/50-split bench seat as a standard feature, providing seating for up to seven passengers. In addition, the SYNC communication and entertainment system, which comes standard on the Eddie Bauer and Limited trims, receives an upgrade for 2010. The infotainment device now includes GPS hardware, which gives owners access to traffic updates, turn-by-turn directions, sports scores, entertainment news, and other information through Bluetooth-enabled mobile phones. In addition to the mid-level Eddie Bauer and the high-end Limited trims, the 2010 Explorer comes in entry-level XLT trims. The Eddie Bauer trims are available in rear-wheel-drive or four-wheel-drive configurations, while the XLT and Limited trims offer a choice of all-wheel-drive or four-wheel-drive systems, as well as the standard rear-wheel-drive configuration. For the Eddie Bauer and Limited trims, owners also have a choice of V6 or V8 powerplants. Exterior features for the 2010 Ford Explorer include a four-bar chrome grille, foglights, power sideview mirrors, rear privacy glass, and roof side rails and crossbars, as well as Ford's Easy Fuel capless fuel filler. The Eddie Bauer trims add a unique three-bar chrome grille, Pueblo Gold front and rear bumpers, and automatic headlights, while the Limited trims feature step bars with chrome accents and chrome roof rails. Although sales have fallen off in recent years, the Ford Explorer remains one of the most popular SUVs available today, and that popularity has remained constant since the SUV's introduction in 1990. Early reports about the 2011 redesign indicate a move to a car-based platform and a lower overall profile, as compared to the Explorer's current truck-based platform. While big changes may be in the works for the Explorer, the current iteration still appeals to owners, who value its smooth ride, responsive handling, comfortable interior, and overall flexibility. All 2010 Ford Explorer trims come standard with a 210-hp, 4.0-liter V6 engine, which carries over from the previous year unchanged. The V6 generates 254 lb-ft of torque and mates to a five-speed automatic transmission with overdrive. For Eddie Bauer and Limited trims, owners can opt for an available 4.6-liter V8 engine generating 292 hp and 315 lb-ft of torque. The V8 features advanced dual-equal variable cam timing technology, which helps improve responsiveness and efficiency. It links to a six-speed automatic transmission. The EPA estimates fuel economy numbers for the V6 at 14/20 mpg (for rear-wheel-drive trims), while the V8 checks in at 14/19 mpg (for 4x4 trims). Both engines, which run on regular unleaded gasoline, provide quite a bit of power, with the V8 driving the Explorer from 0-60 in less than 7.5 seconds. 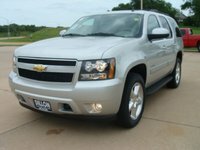 Owners also have a choice of all-wheel-drive or four-wheel-drive systems. The XLT and Limited trims can be equipped with a single-speed all-wheel-drive system or the Control Trac four-wheel-drive system, which offers a driver-selectable Auto mode for daily driving and a High mode when extra traction is required, such as when driving on icy roads or in snow. In addition, when going off-road, drivers can shift the system into the Low setting for optimal traction and stability. The Eddie Bauer trim offers only the Control Trac four-wheel-drive system. A Class II trailer tow hitch with a four-pin wiring harness comes standard on the Explorer. Owners can add a Class III/IV Trailer Tow Package as an option. V6 trims can tow up to 5,000 pounds when equipped with the optional tow package and four-wheel drive, while V8 trims can tow up to 7,115 pounds when similarly equipped. All Explorer trims ride on a four-wheel independent suspension, which allows each wheel to operate independently on rough or uneven surfaces, resulting in a smooth, capable ride. Heavy-duty gas shock absorbers and power rack-and-pinion steering also contribute to the Explorer's well-regarded ride and handling. The XLT trims ride on 16-inch painted aluminum wheels, while Eddie Bauer trims get 17-inch wheels. The top-of-the-line Limited trims provide an optimal ride and comfort, thanks to their 18-inch chrome-clad aluminum wheels. With an optional package, owners can add up to 20-inch wheels on the Limited trims. All trims ride on all-season tires. Passengers in all three rows of seats, including the third-row seat, will find plenty of legroom and headroom. Although some might find the third-row seats lacking in support, the driver and passenger will find plenty of support and comfort in the front seats, even over long distances. Instrument gauges are easy to read, although some drivers will find certain knobs and switches difficult to reach. Interior storage spaces are limited to the standard glovebox, center floor console, and requisite cupholders. Some owners find the Explorer's quiet, roomy cabin lacking in ergonomics. The awkwardly positioned shift lever, for instance, draws negative comments from some owners, since it can block access to the climate controls. The door handles have also received complaints from owners. Overall, however, most owners find the Explorer's interior well-constructed with good materials. Standard features for all Explorer trims include a leather-wrapped multifunction steering wheel, air conditioning, cruise control, power windows, remote keyless entry, and a 60/40-split second-row seat. The XLT also includes a two-line message center with an outside temperature display, an AM/FM audio system with a CD player, and cloth first-row bucket seats with a six-way power-adjustable driver's seat. The Eddie Bauer trims add leather seats, heated front-row bucket seats, a 10-way power-adjustable driver's seat, wood-grain interior accents, a third-row fold-flat bench seat, a four-line message center, and Sirius satellite radio. The Eddie Bauer trims also include the Ford SYNC infotainment device. Standard features for the top-of-the-line Limited trim include a six-way power-adjustable passenger seat, power-adjustable pedals, dual-zone climate control, a PowerFold third-row seat, and a 190-watt premium audio system with a 6-CD changer. Options packages for the Explorer Eddie Bauer and Limited trims add such features as a voice-activated navigation system with a nearly 10-gigabyte hard drive, a rear-seat DVD entertainment system, a power moonroof, and second-row bucket seats. With all three rows of seats up and in place, the Explorer offers a fairly meager 13.6 cubic feet of storage space behind the rear seat. With the third row folded down (or not included), cargo capacity expands to slightly more than 45 cubic feet, and with both the second and third rows folded down, the Explorer offers nearly 86 cubic feet of storage space. A rear cargo shade and Cargo Management System, which consists of cargo netting and floor bins, come standard on all trims. A one-piece liftgate with flip-open rear window provides access to the rear cargo space. The National Highway Traffic Safety Administration awarded the Ford Explorer a top rating of five stars for protecting passengers during front and side-impact crashes, and three stars for protecting passengers in the event of a rollover. Standard safety features include dual front airbags and a Safety Canopy System with side-curtain airbags and a rollover sensor. Antilock brakes and the AdvanceTrac traction control system with Roll Stability Control also come standard. In addition, a Trailer Sway Control system applies brakes if necessary to help the driver keep the vehicle under control when towing a trailer. The Limited trims include a Reverse Sensing System, which alerts drivers if objects are in the vehicle's path when backing up. 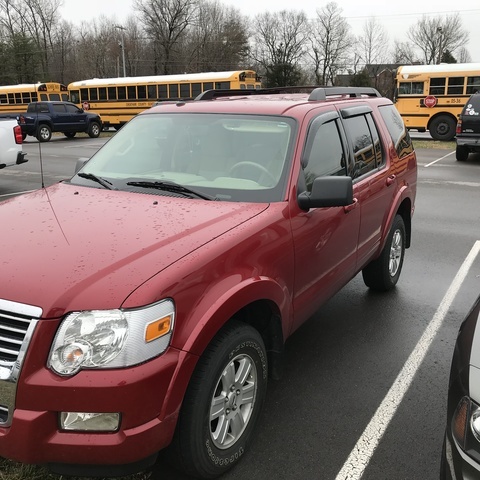 Overall, owners give the 2010 Ford Explorer good reviews, thanks primarily to its exterior styling, interior comfort and functionality, and good ride and handling. Owners also like the Explorer's seven-passenger seating on trims with the third-row seat, as well as the SUV's off-road-capable four-wheel-drive system. The Explorer's quiet interior, solid body structure, decent performance, and good towing capacity also draw positive comments from owners. On the downside, the layout of controls, some of which are out-of-reach for shorter drivers, remains a sore spot with some owners. Some owners also still voice concerns about safety issues, particularly rollovers. What's your take on the 2010 Ford Explorer? 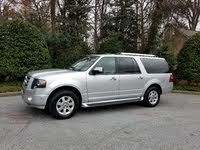 Guru9NT2H I own a 2010 ford explorer and I've off roaded with it. 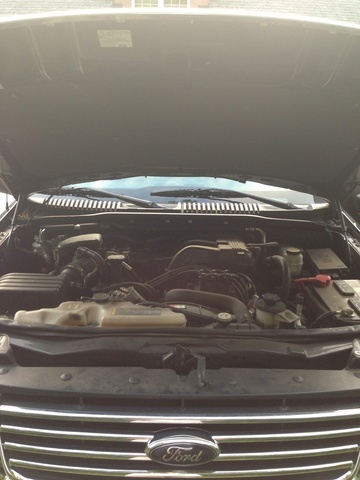 I found going over rocks the front end twists and in my case the radiator came out of its mounting brackets. Driving this way was a l9ittle noise starting off then quiet until I got home. Next day noisy at start then quiet! Found problem and fixed it without any further noise! Users ranked 2010 Ford Explorer against other cars which they drove/owned. Each ranking was based on 9 categories. Here is the summary of top rankings. Have you driven a 2010 Ford Explorer?